This Alitta brandti polychaete worm, seen in California by @raulagrait, is our Observation of the Week! 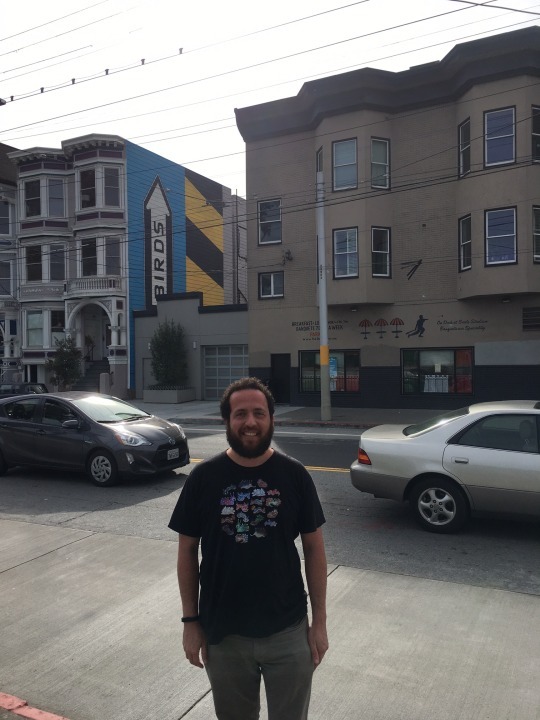 Born and raised in Puerto Rico, “with iguanas climbing into in my bathtub and lizards always nearby when I played outside or in my backyard,” Raul Agrait is now a San Francisco Bay Area resident. By day he’s a software engineer (“I once fixed a bug on iNaturalist for iOS - hooray!”), but he’s also become an amateur naturalist. 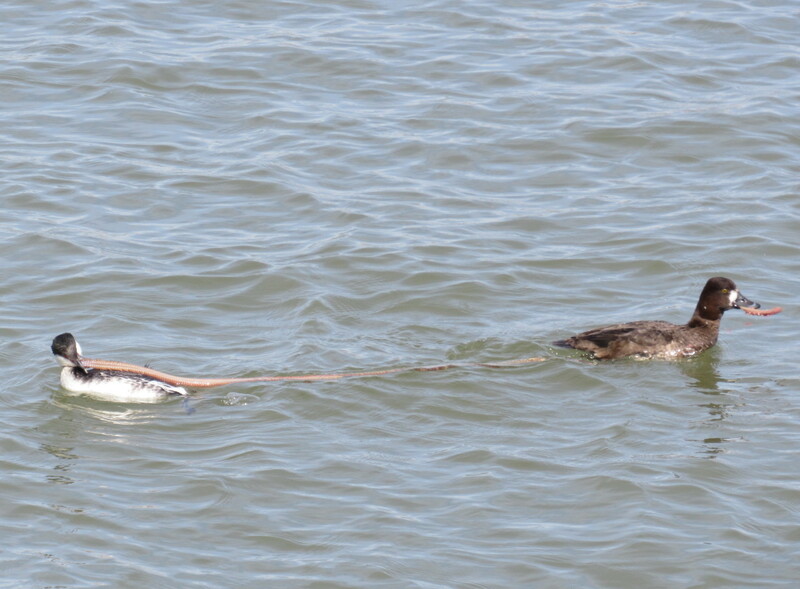 After walking for a short while, I saw the Horned Grebe and noticed that it seemed to be pulling on something. 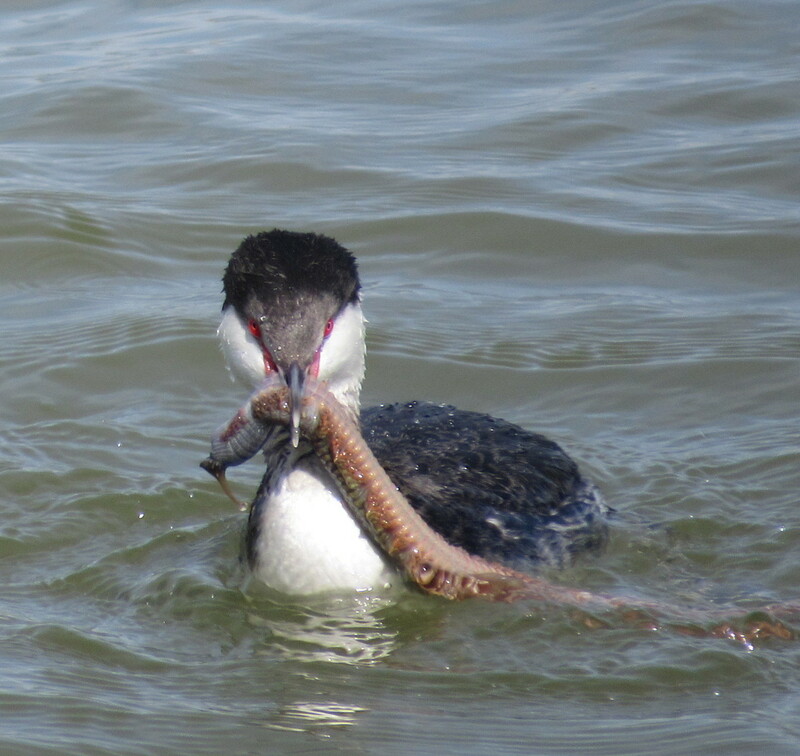 From a distance, I thought it might be a piece of kelp, because I noticed that it dragged on for quite a way behind the Grebe...then I noticed that a duck started following the Grebe and grabbed ahold of the other end of the worm. At first they swam in the same direction, but after a bit they started doing a tug of war and pulling in opposite directions..After a while, about a half dozen other Scaups joined in and started gnawing at the worm as well. Eventually several other Scaups joined in the fray, but unfortunately Raul had to return to work so he couldn’t capture the rest of the feeding frenzy. “Frankly, I had no idea what kind of worm that was, or if it even was a worm at all, and find it so amazing that it could be identified and shared with so quickly by experts in the field,” he says. iNat user @leslieh, marine worm identifier extraordinaire, was able to get this worm to species: Alitta brandti, which is the longest polychaete worm along the western coast of North America, reaching lengths of 1-1.5 meters (!). Like all polychaetes it has a body made of segments that have parapodia, or protrusions on each side. These parapodia often end in bristles called setae, and are used for locomotion as well as respiration. When immature it often lives on the seafloor, but when sexually mature it begins swimming to find mates, often in spring or summer. Our whole family enjoys browsing through observations on iNaturalist together, we use it to plan our family outings ("What species are nearby here? ", "What's the closest place we can see this bird? "), and will share observations with each other as readily as news articles. My daughter, who also uses iNaturalist, went away to college out of state this past year, and one of my favorite things in the world is when she shares her observations with me ("Look at this different Phoebe! ", "I finally saw a Belted Kingfisher!"). - Of course there’s a video of an Alitta brandti (here known by a synonym, Nereis brandti), this one found off the coast of Oregon. A great look at its parapodia at work. - And more wormy wonders of the ocean. - July 1st is International Polychaete Day, and the Smithsonian posted a great article listing 14 facts about polychaetes! WOW! ...just found your great shots from link to the Worm family from this weeks obs. of the week! Pretty amazing to see such a big Worm! !